Humans have been topping bread with all sorts of foods, both simple and extravagant, since the Middle Ages. 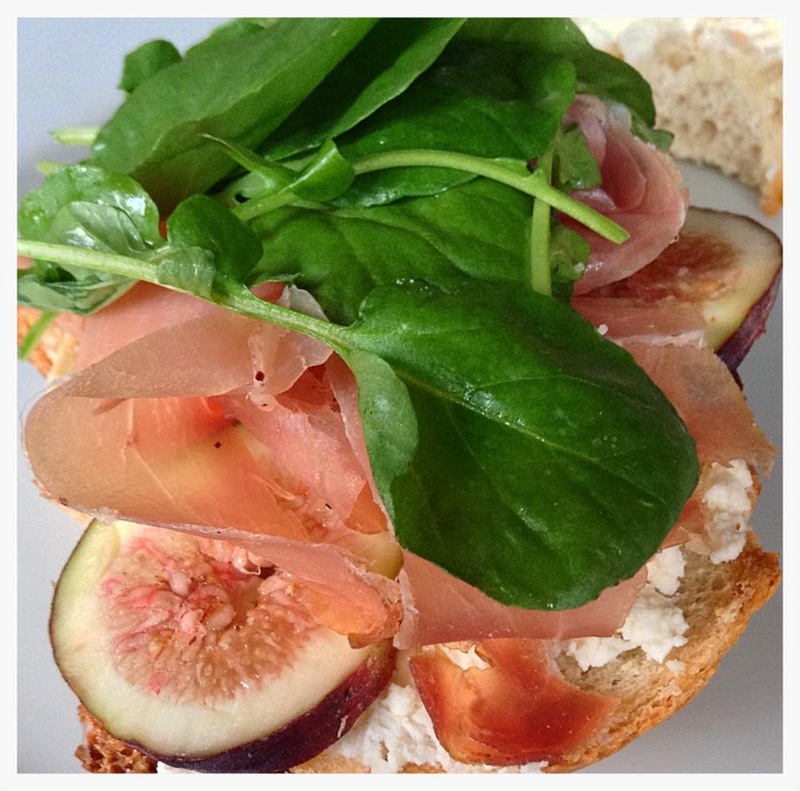 It seems most every culture has adopted some form of open faced sandwich. Italy gave us crostini, Denmark the smørrebrød. And the French - those clever French, who do everything "food" so well - gave us the ever perfected Tartine! In the late 15th century, thick slabs of bread called "tranches" (or "trenches") were used as the vessel for serving food. An edible plate of sorts. Piled with meat, cheese or whatever the meal might be, the bread soaked in the juices and flavors of that meal, preserving its memory. It was then enjoyed (or donated to the family hound or neighborhood beggar) as a delectable end to the meal. Thus the tartine was born! Boy, those French really do know how to eat well! Because the topping possibilities are vast, Tartines can span all seasons but it's my summer palate that really craves them. Spread with mild cheeses and cold meats, they're light but filling. Ricotta (get the homemade and highly-superior-to-store-bought version here), prosciutto and figs is a fairly classic combination and perfect for summer (though with those ingredients, just as Italian as it is French, I suppose). I like to add some dressed greens to my Tartines as they add a nice touch of freshness and color. 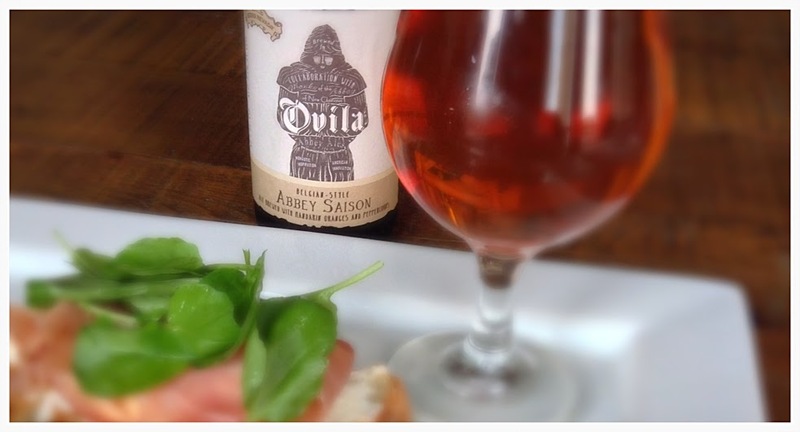 I chose Sierra Nevada's excellent lemon and pepper hinted Ovila Abbey Style Saison for this pairing. It's a collaboration beer with the monks from New Clairvaux Abbey in Vina, Ca and perfect for summer. For the greens, I got some beautiful, spicy watercress from City Farms which was treated to a light dressing of tangy orange, tangerine and lemon vinaigrette. Toppings aside, obviously the bread is a very important component of this dish. Without bread, there is no tartine! "It's the plate", as 15th century Frenchmen might say and it's the vessel that all the other ingredients depend upon. Thickness of cut, density of loaf and crunchiness of crust - these are all crucial elements to a good tartine. And what's better than plain bread? Why beer bread, of course! After much research and practice (because even for a chef, baking can be tedious) I am proud to say that I have nearly perfected the recipe and technique I found in Cook's Illustrated a while back (which, incidentally, is a terrific magazine for serious cooks). Sometimes I use the beer I'm pairing with and sometimes I don't. The beer needs to have residual sugar to feed the yeast in the bread so not every beer will work as well. The Ovila, however, works perfectly! In a stand up mixer incorporate the dry ingredients on low. Combine all wet ingredients in a large cup or bowl. Keep the mixer on low and slowly add the wet ingredients into the dry. Notice the ingredients forming a dough, make sure to turn off the mixer and scrape the sides to incorporate all flour. Round the dough ball in the bottom of the mixer bowl and place a towel over it. Let proof (stand) for 8-12 hours at room temperature (overnight is best). Once the dough has proofed, knead once and let rise for 1 hour more. Pre heat the oven to 500 degrees and place a lidded on a cast iron dutch oven inside. Turn the oven down to 420 degrees and place the dough in the dutch oven. Make a slice ¼ inch deep cut in the top to allow the dough to expand (I like to make an x on mine as seen below). Bake with the lid on for 30 minutes. Uncover the dutch oven and bake for an additional 20 minutes to allow the crust to form. Wait 20 minutes to it to cool. Slice. Toast beer bread under broiler, checking often so as not to over brown. Spread fresh ricotta on toasted bead. Lay the sliced figs on the ricotta followed by 3-4 pieces of prosciutto. Finish with a small handful of the dressed watercress. Notice, from the pour, a bright orange color with mild haze and a lacy head. The aroma is bold with strong citrus notes and yeasty spice. There is a pleasant flavor progression that begins with lemon, moves to spicy pepperiness, followed by earthy and malt notes and finishes with bright orange. This pairing is a very direct comparison of the beer and food. The toasted beer bread replicates the malt backbone that holds the beer's balance together as well as the tartine's. The lemon ricotta is a gentle mimic of the bright citrus aromas and the creamy head. Note that the dressed greens are an essential part of this pairing as the pepperiness from the watercress and the citrus from the vinaigrette play well to the spice and orange finish of the beer. Meanwhile, the saltiness of the prosciutto is a good counter to the earthy yeast esters. It's so good! Moist and hearty. Ripe figs, fresh off the tree will make this all the better!